Dr. John Newman will perform his solo play, THE MAN BEHIND THE CURTAIN, at the Salt Lake City Main Library, 220 E 400 S, on Monday, September 11 at 7p in the Nancy Tessman Auditorium, just off the atrium. This free public performance runs approximately 75 minutes. Before finding his calling as a writer of children’s stories, Baum struggled to make his living as an actor, director, store-owner, baseball team secretary, small-town newspaper editor, reporter, and traveling salesman. In the play, L. Frank Baum tells how each of his professions developed his abilities as a storyteller and how he transformed his dreams and nightmares into his best known story. His life intersects with American notables including author Charles Dickens, inventor Thomas Edison, and his mother-in-law, suffragist Matilda Joslyn Gage. While the play is G-rated and features a famous children’s book author, it is aimed at adult audiences, though all ages are welcome to attend. Children as young as ten have been engaged by the play; younger children might be bored by it. The play will also have public performances at the Provo Library, Monday, October 9 at 7p and the Orem Library, Monday October 23 at 7p. It will be performed on Saturday, September 23 at 2p at the United Solo Festival at Theatre Row on 42nd Street in New York City. Tickets for all shows at United Solo are $35 plus fees and can be obtained by following this link. In buying tickets on line, note that the ticketing site will list the time (Sept 23 @ 2p) but not the title; this is only show at United Solo scheduled in that timeslot. Dr. Newman developed the play during a residency at the Open Eye Theater in upstate New York in October 2016, with the premiere production under the direction of Dr. Tania Myren. He has since performed the play in Syracuse, New York and Coronado, California; places associated with L Frank Baum’s life and writing. Newman hopes to perform the play in other places associated with Baum, including Aberdeen, South Dakota; Chicago, Illinois; and Holland, Michigan. John Newman earned his PhD in Educational Theater at New York University, with concentrations in theater for young audiences and playwriting. He has been a professor of theatre at Utah Valley University and Director of the Noorda Theatre Center for Children and Youth since 2010, after teaching and directing theatre for eighteen years at Highland High School in Salt Lake City. As a playwright, Newman has created stage adaptations of novels for Newbery medalists including Avi, Paul Fleischman, Richard Peck, and Jean Lee Latham. Following its premiere at the Open Eye Theater in Margaretville NY, J. D. Newman has performed The Man Behind the Curtain at the Onondaga Historical Association Museum in downtown Syracuse NY, Utah Valley University in Orem UT, Chapman University in Orange CA, and Holladay City Hall in Holladay UT. The show will return in the summer of 2017 with performances anticipated in Utah libraries, New Orleans LA, and in sites associated with the life of L. Frank Baum. Contact john.newman@uvu.edu if you are interested in booking a performance. For Fall 2016, I am taking a one-semester sabbatical from Utah Valley University and doing a six-week residency at the Open Eye Theater in the Catskill Mountain region of upstate New York. I am performing my original one-man play, The Man Behind the Curtain, under the direction of Tania Myren, and directing my adaptation of my novel Sandy and the Weird Sisters. The Man Behind the Curtain centers on L. Frank Baum, best known as the author of The Wonderful Wizard of Oz. 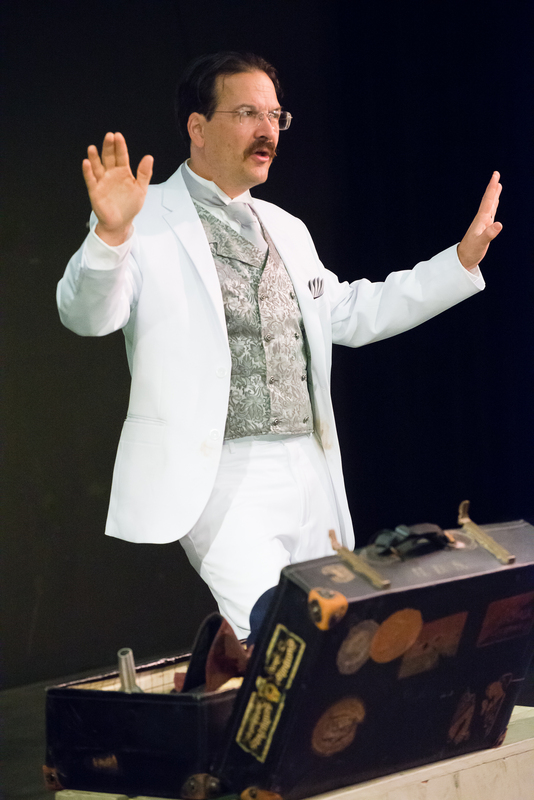 In the play, Baum confronts an audience disappointed by the cancellation of his theatrical production “The Fairylogue.” He offers them his own personal story of his life as the head of a theatre troupe in New York, as a merchant, baseball promoter, and newspaper editor in South Dakota, as a reporter and china salesman in Chicago, and finally as a writer of children’s stories. The play encourages the children in the audience to imagine impossible things, as he did throughout his life. The drama shows how elements of Baum’s life came together in his best-known story that can be seen as his personal myth. Sandy and the Weird Sisters tells the story of 12-year-old Sandy Hunter as she redefines herself one summer when she is dropped on the doorstep of her three great-aunts, referred to by the family as the “weird sisters.” The dramatic adaptation has been customized for the casting pool of the small town in New York, with roles for older actors and young girls. The Noorda Center is sponsoring the second annual Old Miner’s Children’s Playwriting Contest. Submission deadline is Wednesday, February 3. Plays must be appropriate for performance for or by children 12 years old and younger. The winner of the national division (playwrights living in the continental United States) will receive $1000 and lodging, airfare, and per diem for a one-week development process culminating in a staged reading by UVU student actors in April 2015; dates to be arranged between the writer and the Noorda Center upon selection. The winner in the Utah college division will receive $250, a preliminary reading, and a final reading a week later and will participate in the development of the national winner’s script. There is also a $500 “Strike It Rich” prize available for a winning play that is based on the lives of real children. The following plays are listed in Leicester Bay’s Premiere File and while they have had staged readings and development workshops, they are awaiting a full premiere production. Leicester Bay Books has also published J.D.Newman’s first novel SANDY AND THE WEIRD SISTERS, available from amazon.com. Utah Valley University’s Noorda Theatre Center for Children and Youth will be presenting John Dilworth Newman’s adaptation of Jean Lee Latham’s Carry On Mr. Bowditch as a touring production in Utah Schools through December 11. There is still one touring date available on Wednesday, December 9 for a school in Utah Valley. Contact Kynsie Kiggins at 801-863-KIDS or noordacenter@uvu.edu to book this performance.